What does a checkmark (asterisk online) by the grade mean? In rare cases, a comic book will look much better than the given grade. In these rare cases, a Check Mark will be placed on the label by the numerical grade. The best way to understand why a specific comic book received a Check Mark designation is to refer to the graders' notes. Example: a comic is graded 8.0. However, the covers are such that it looks like a 8.5 or a 9.0. CBCS denotes that eye appeal by using the Check Mark and asterisk symbols. How do I submit comics for CBCS Pressing? Currently, you have to write on the invoice that you want the comics pressed. It is suggested that you follow through with an email or phone call to CBCS customer service. When are my comics received? If you submit at a convention, your books will be officially received the Wednesday after the con (barring holidays). If you submit by mail, your received date will be the the next business day after they are delivered by your shipper. In most instances. it can take 2-3 weeks before your books get entered into the computer. This does NOT effect your received date. For large cons or during the con season, it may take longer. What is the cost of pressing? 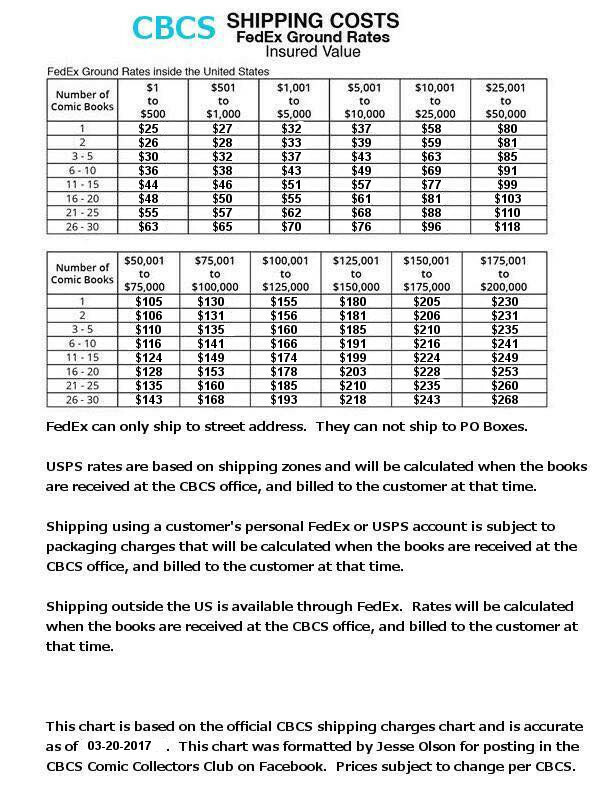 What are the current shipping charges? 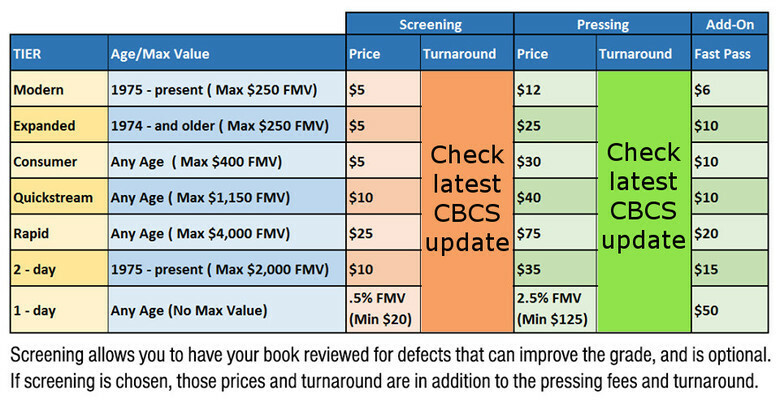 This is the latest shipping charges from CBCS. They are subject to change. Use this as a guide. How does a peeled digital code effect the grade? A comic with a peeled digital code CAN score up to a 9.6, but not above. Who does CBCS use to verify signatures? CBCS uses CSA Comics, LLC. To find out more about the company, how they verify and a list of popular names that they verify, please visit their website. If a name is NOT on their list, please contact CBCS with the name to see if it can be verified as the list is not comprehensive. How large of a drawing can I submit for the ART program? The maximum dimension for these are 10.25 inches tall by 7.25 inches wide. There are some restrictions, please contact Customer Service if you have questions. There is no minimum size requirement. Can an Authentic ART labelled comic be graded and retain the Authentic Signature label? Yes. An Authentic Signature (yellow label) ART comic can be graded and will still be an Authentic Signature (yellow label) graded comic. This works both ways as long as the slab is submitted unopened to CBCS. If a comic has witnessed and verified signatures on it, which label will it have? If a comic has a Verified (red) label on it, it will always have a Verified (red) label unless you choose to not have the signature verified on the label and have it noted as "writing on the cover". What are these marks on the sides of my slab? Those are the result of the manufacturing process of the cases. They are a normal part of the case and are quite common. They are not a defect and they do not harm the integrity of the case. What is the maximum size a comic book can be? The maximum size is 7.625" x 10.5" and .24" thick. Do I need to send COA, 3D glasses, polybag, etc. with my comic? No. CBCS does not recognize COAs. Anything besides the actual comic book will be not be encapsulated and will be returned when the order is complete. Comics are best removed from the polybag. For a book to qualify for the Authentic Signature Program (Yellow label), does a CBCS approved and authorized witness need to be present when the book is signed? What is to stop someone from switching out labels on a CBCS slab? In September, 2017, CBCS announced that they will be placing a heat seal through the CBCS logo on the label. If anyone attempts to remove a label, the logo will be ripped. 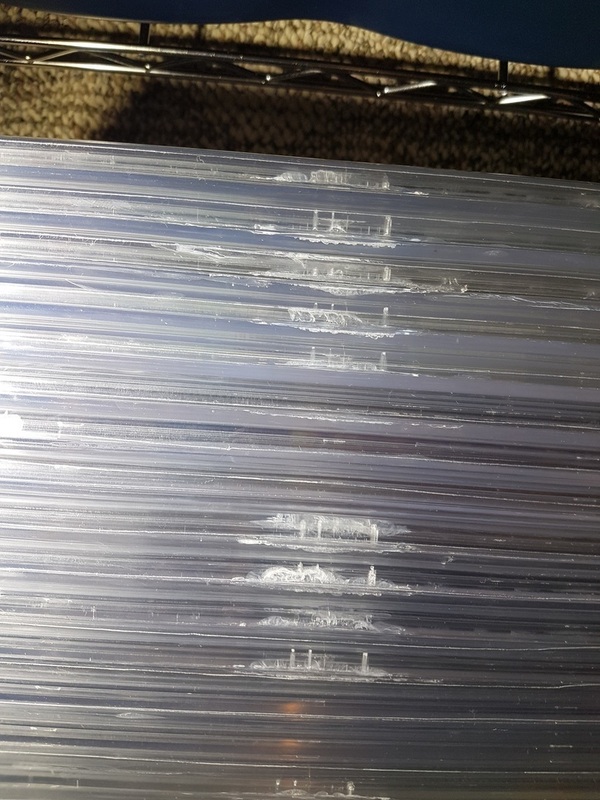 Does CBCS honor CGC Signature Series slabs? Yes, CBCS honors CGC Signature Series. They are the ONLY company that CBCS will honor. Where are the FAQs on the CBCS website? Where are the Featured Comics on the CBCS website? Where are the grading guidelines on the CBCS website? How do I contact CBCS?